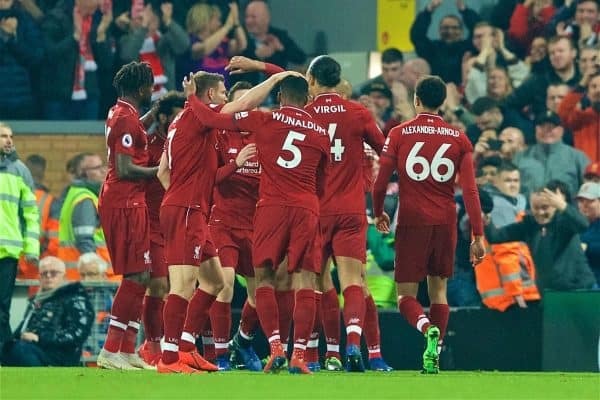 Liverpool maintained top spot in the Premier League with an emphatic 5-0 victory over Watford at Anfield, with several candidates for Man of the Match. Rarely called into action throughout most of the match, Alisson was alert on two occasions to deny Andre Gray twice in the second half, including an excellent reflex stop from point-blank range. 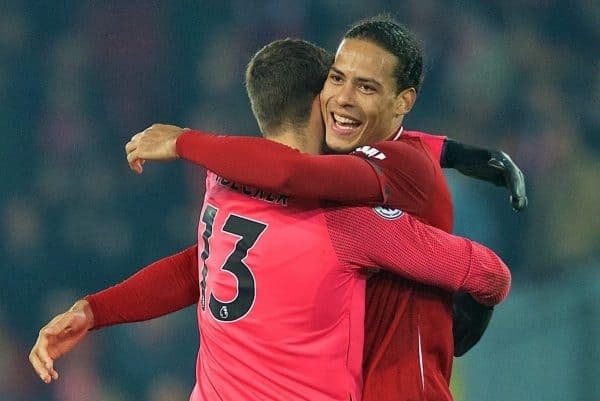 Those interventions meant the Brazilian played his part in keeping his 16th league clean sheet of the season—the most of any goalkeeper—and Liverpool’s fourth in a row. It’s not often you can say a right-back completely transforms a team’s attack, but Trent brought a whole different dimension to Liverpool’s play in the final third here. Constantly available on the overlap, he put in two superb crosses for both of Sadio Mane‘s first-half goals to put Liverpool firmly in control of the contest, and could have had several more assists thereafter. Other than a goal, it’s almost impossible to ask any more in terms of quality delivery from a full-back. Up there with Trent’s best-ever displays for Liverpool. Matip has stepped up well in recent weeks in the absence of Dejan Lovren and Joe Gomez, and was impressive again here. His crucial interception denied a near-certain goal in the first half to cut out Gerard Deulofeu’s dangerous cross, and another key block kept out Craig Cathcart after the break. Positionally excellent throughout, reading the game superbly, and showed composure in possession. Dominated the physical battle with Troy Deeney and was imperious in the air as ever, winning countless headers and making several well-timed challenges, including a smart tackle on Deulofeu on the counter-attack in the second half. Capped off his display emphatically with a second-half brace with two thumping headers in front of the Kop, taking his tally up to three goals for the season. Liverpool have lacked goals from defenders this season, and Van Dijk certainly has the ability to chip in more regularly on this evidence. After several slightly below-par performances of late, Robertson was back close to his best, rampaging forward up the flank to join the attack at every opportunity. 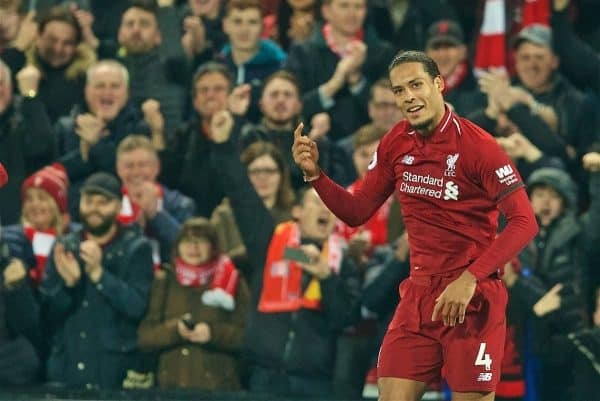 Defensively he was rarely tested—one needless foul in the second half aside—and contributed two assists for Van Dijk and Divock Origi, taking his total up to a remarkable 10 for the campaign. 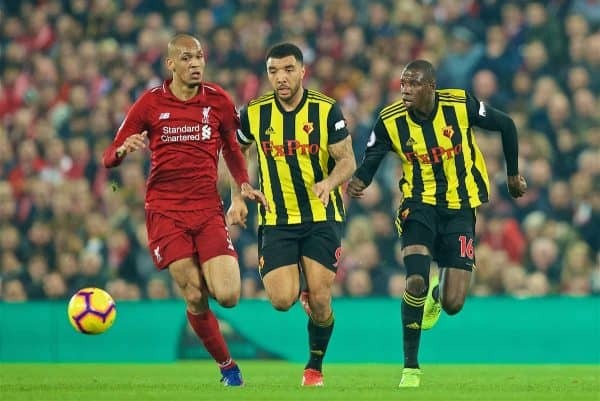 Fabinho has emerged as one of Liverpool’s most influential and consistent performers over the past few months, both in midfield and in defence. He patrolled the midfield with supreme confidence, constantly ensuring he was in the right place at the right time to break up play and put Liverpool back on the front foot. A lung-busting run to track back and time his tackle perfectly to dispossess Deulofeu in the first half drew rapturous applause from the stands, and his use of the ball was intelligent and incisive. Close to the complete midfield performance, only missing a goal or an assist to add some extra gloss to a fine evening for the Brazilian. Typically industrious and perhaps the most understated midfield performer for Liverpool on the night, Wijnaldum put in his usual excellent shift and was everywhere he needed to be. Linked well with Trent and Mohamed Salah in particular with short, sharp passing triangles, and used his body superbly as ever to spin away from opponents and drive into space. Understated, but still a key performer in an outstanding team performance. Perhaps a surprise inclusion in the starting lineup after a disappointing performance at right-back against Man United at the weekend, Milner quickly put to bed any concerns and was integral to setting the tempo early on. Pressed superbly, and broke the lines well to take up clever positions in the final third, Milner showed he can still do a more than competent job in midfield when called upon and fully justified Jurgen Klopp‘s selection. It’s not often Liverpool score five goals and Salah isn’t involved in any of them, but this was a much improved display after his peripheral showing at Old Trafford. 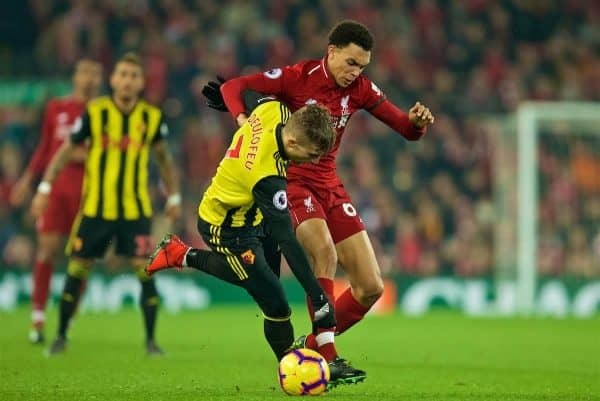 The Egyptian constantly got himself on the ball, dribbled aggressively at Watford‘s back line and was unfortunate not to get on the scoresheet on several occasions, notably hitting the post in the first half. A lovely dinked pass to Robertson ought to have been converted into a goal as the Scotsman couldn’t quite pick out Mane in the middle. A searing burst of pace saw him play his part in the lead up to Mane’s second goal, and throughout he constantly linked up with Trent and was a prominent figure in the majority of Liverpool’s action in the final third. Opening the scoring with a well-taken header inside 10 minutes, Mane played through the middle and looked at ease in the No. 9 role, taking up excellent positions inside the six-yard box and dropping deep to link play in the absence of Roberto Firmino. His audacious backheeled finish was a sensational piece of skill to deceive Ben Foster and double Liverpool’s advantage, taking his tally up to 14 league goals for the season—his best-ever return—and 15 in all competitions. Should have completed his hat-trick in the second half, but saw his attempt well blocked by Cathcart. Another decisive showing from a player who has arguably been Liverpool’s top performing attacker since the turn of the year. Selected ahead of Daniel Sturridge after the Englishman’s ineffectual cameo at Old Trafford, Origi justified his inclusion and worked tremendously hard up and down the wing. His holdup play and use of the ball was sensible, and he was never afraid to take on Daryl Janmaat when the opportunity presented itself. Got himself the goal his performance deserved in the second half, cutting inside before arrowing a hard, driven finish through a packed penalty area for his third goal of the season. The best compliment you could pay the Belgian was that Firmino’s absence wasn’t remotely costly. 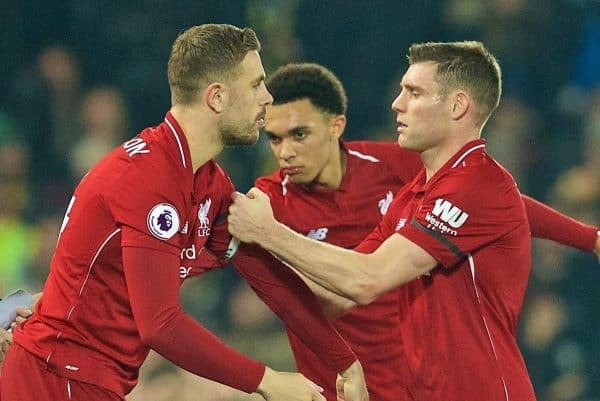 Henderson’s introduction gave Milner a well-earned break after the game had already been wrapped up, and the captain helped maintain Liverpool’s control in the final stages to ensure no late complacency set in. A brief stint up front in the closing stages was a bizarre sight, but the points were well and truly in the bag by then. A brief cameo in the final few minutes, Keita will surely feature prominently in the coming weeks after signs of picking up some promising momentum prior to a recent illness. 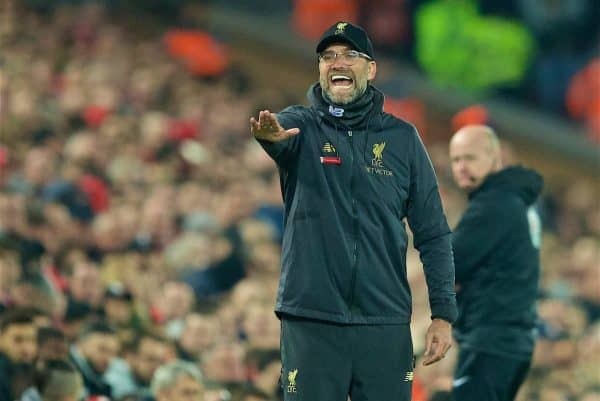 The manager’s pre-match message was emphatic, stating that Liverpool are absolutely fine with their current position and should see it as an opportunity, as opposed to paying too much attention to the pressure of the title race. He made a bold call in picking Origi over Sturridge and Xherdan Shaqiri, and his selection of Milner in midfield also paid dividends. Liverpool needed a shakeup in an attacking sense after consecutive 0-0 draws against Bayern Munich and United, and he found the right solution here. 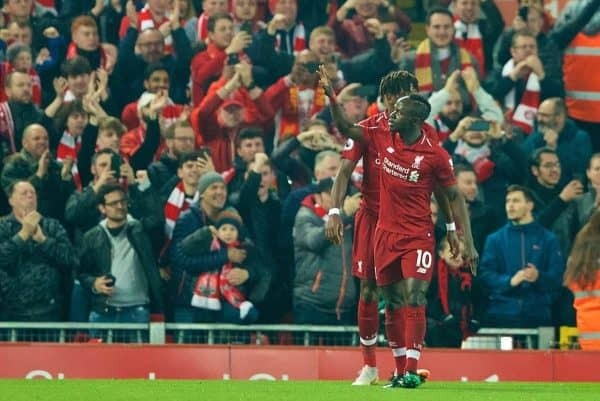 Playing Mane through the middle—which he has rarely ever done—proved an inspired choice, as he filled in superbly in Firmino’s absence and showed Liverpool can change things up without the Brazilian. The flurry of goals in the second half will please Klopp enormously, sending out a strong message that Liverpool won’t be perturbed by recent frustrating results. It was the perfect response after a tricky period—and he will hope to use this as a platform to kick on with only 10 games left to play.